Born Henry Besterman on September 16, 1886 in New York City. At an early age he moved to Philadelphia, Pennsylvania and would call it home the rest of his life. Fighting during the “no-decision” era, Lewis began boxing in 1904 and rose to prominence in bouts with Joe Gans, Willie Lewis, Jimmy Gardner, Mike (Twin) Sullivan, and Jack Blackburn. The welterweight title was in dispute during this period with several boxers, including Sullivan and Frank Mantell, claiming the title. Following a third-round kayo over Mantell on Janaury 23, 1908 and a fourth round kayo over Honey Mellody on April 20, 1908, Lewis claimed the vacant world welterweight championship. Based on these two victories, and Sullivan relinquishing his claim due to weight issues, Lewis' claim was recognized as legitimate. Four title defenses followed, including a pair of 25-round draws against Willie Lewis in 1910 in Paris. Incidentally, Lewis was extremely well liked in Paris and is credited with popularizing the sport there. He relinquished the title in 1911 and in January 1912 he scored an eighth round kayo over Dixie Kid in Liverpool. Following a fifth round kayo loss to Joe Borrell in 1913, Lewis collapsed from a blood clot and nearly lost his life. 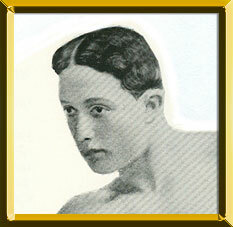 Lewis, who was managed by Al Lippe, retired with a record of 80-16-11, 56NDs (42 KOs). He died on February 22, 1956 at the age of 69 in Philadelphia.